Oimex Electrode Limited IPO Lottery Result Published on 05 October 2017. Oimex Electrode Ltd subscription open 05 September 2017 and Close 13 September 2017. Oimex Electrode Limited IPO Lottery Result Published. Oimex Electrode Limited IPO Lottery Result & Information updated. 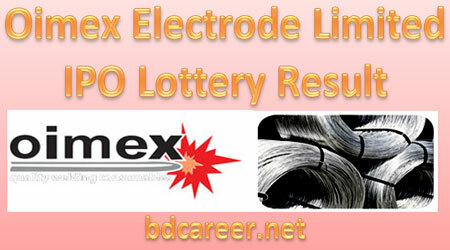 Download Oimex Electrode Limited IPO Lottery Result & Information that will be published here. Initial Public Offer (IPO) is the first sale of a stock by a private company to the public company. In a way, a company can increase money by issuing either debt or equity. Share market inauguration is a type of public offer in which shares of a company generally are sold to the predictable investors that in turn, sell to the general public by a securities exchange for the first time. This way, a private company converts into a public Ltd. company. IPOs are often issued by smaller or newer companies seeking the funds or capital to expand, but can also be done by large privately-owned companies looking to become in public trading. 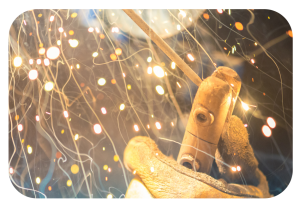 Initial Public Offer (IPO) of Oimex Electrode Ltd.
Oimex Electrode Limited IPO Lottery Result found here. 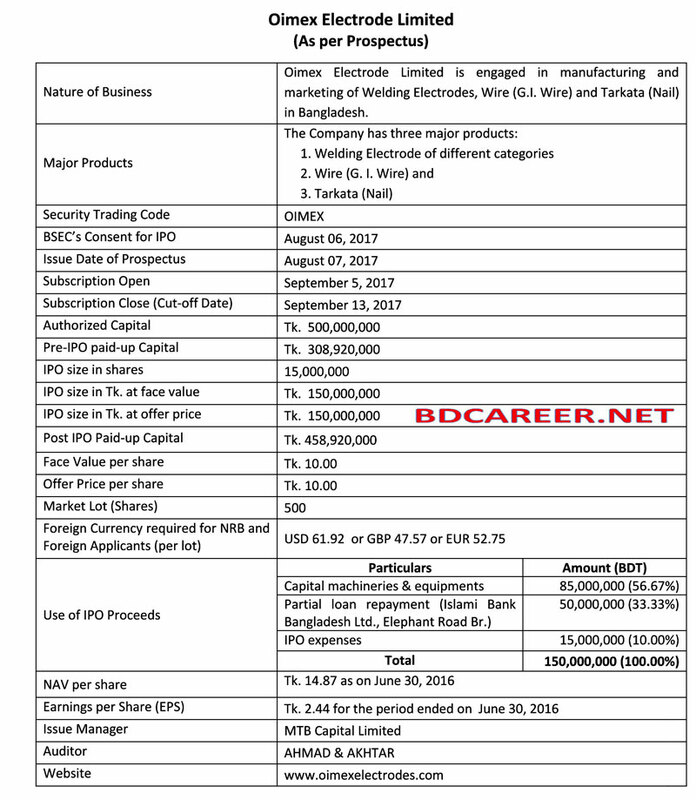 Bangladesh Securities and Exchange Commission (BSEC) has approved the initial public offer (IPO) of Oimex Electrode Ltd. on 09 May 2017 at their 604 Nos. meeting. The company has expressed its intention to collect Taka 15 crore from the capital market offering 1.5 Crore ordinary shares to issue share prices at Taka 10 as face value. 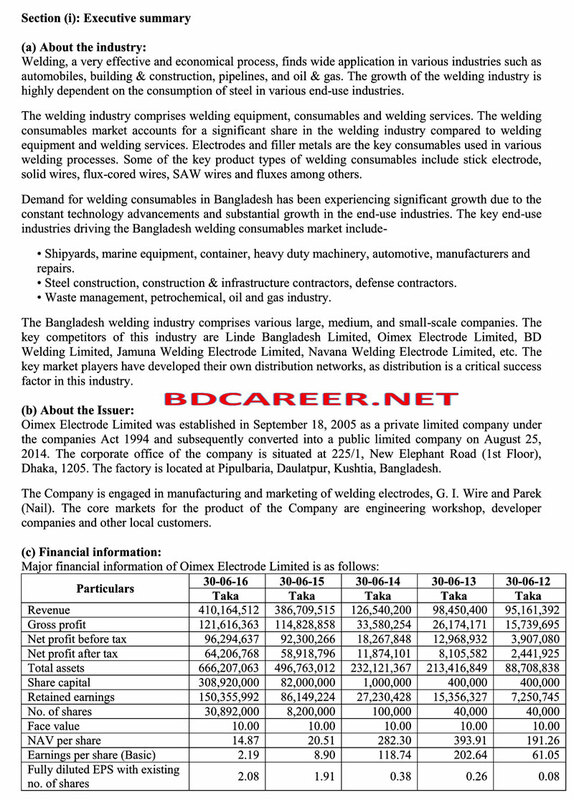 The company’s earning per shares (EPS) Taka 2.19 (Basic) for the period ended on and net asset value (NAV) Taka 14.87 according to the financial statement as on 30 June 2016. MTB Capital Limited working on behalf of the company’s issue manager. The company will spend the capital for Business expansion, acquisition of Plant & Machineries, Building & other civil works and IPO related other relevant expenses. Oimex Electrode Ltd. IPO Lottery Result has been published. 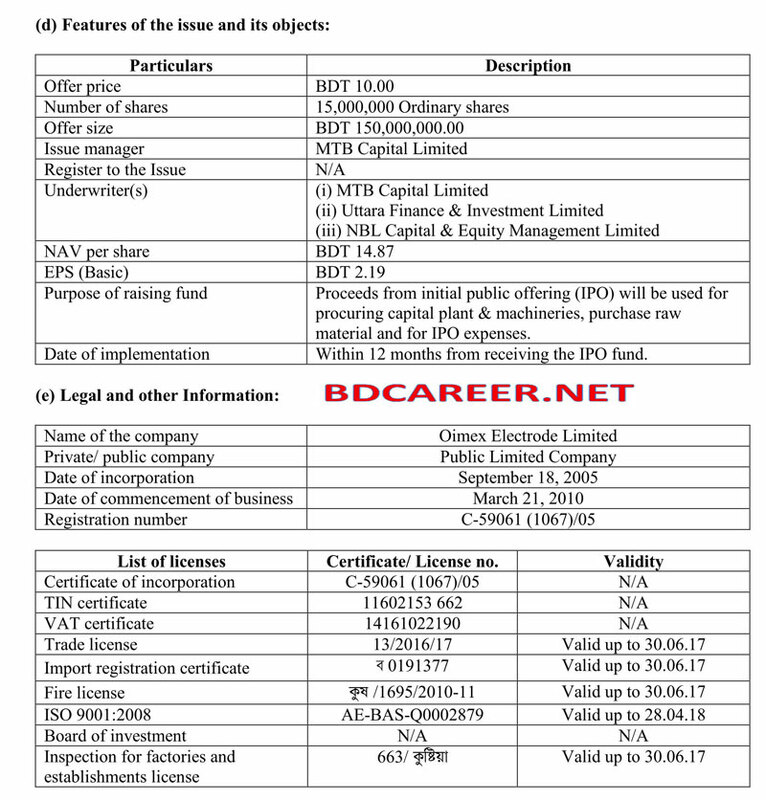 Download Oimex Electrode Ltd. IPO Lottery Result from here. After ending of application of Initial Public Offer (IPO) from 05 September 2017 to 13 September 2017 Oimex Electrode Ltd. IPO Lottery Result published today on Thursday, 05 October 2017. Place: Engineering Institute, Ramna, Dhaka at 10:30 A.M. See the Result below. Total Applied ……. Times, General Applied …, Affected Applied …, NRB Applied .., MF Applied … and Intuition Applied … Times.